Ruuti a day before the opening phase of the whelping with her huge babybelly - She is still very playful as you can see from the picture! On the second of June Ruuti (Kivisilman Monitoimikone) woke us up 5.30AM early morning by wanting to go outside and dig a hole for herself in the bushes. We managed to coax her inside with a loaf of bread. 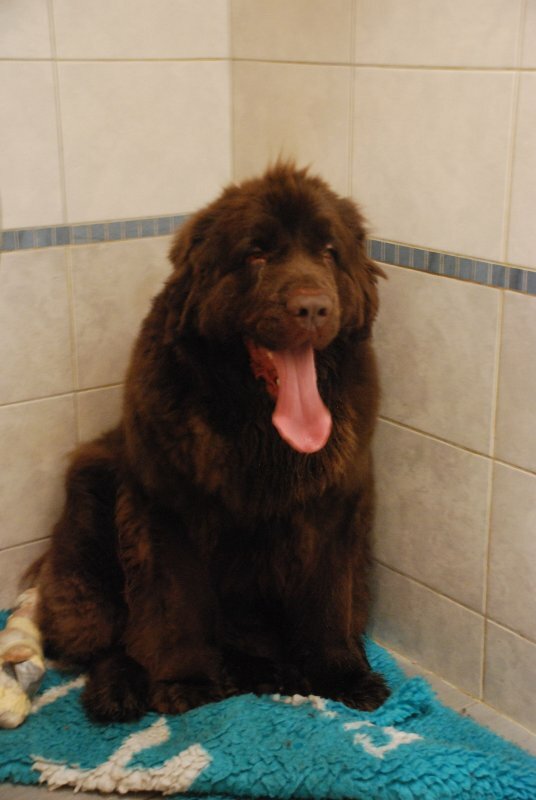 Fifteen minutes later, we noticed that she was panting very heavily and stopping every few minutes for a breather. She was starting the opening phase of the whelping process. Puppies..! 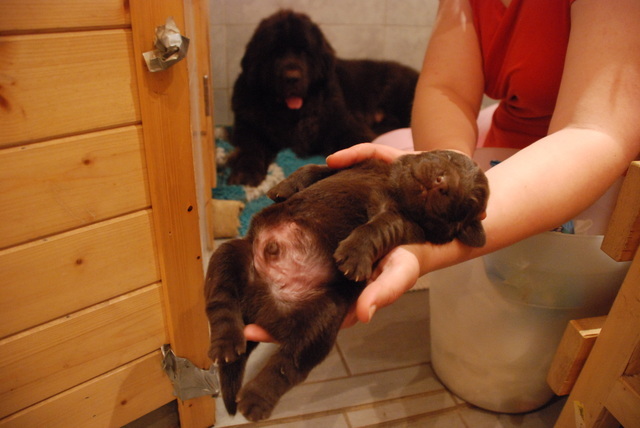 A few last things were rushed downstairs to the puppyroom, and after that the rest of the day spent on our tiptoes waiting for Ruuti to start pushing the puppies out. The opening phase has always taken roughly 24 hours (or more) with our previous litters, so we were expecting Ruuti to start whelping towards the evening or early morning of that day. It was quite a warm day, so Ruuti insisted going outside on the porch in the shade to cool down and start digging her den. She emptied her bowel, refused to eat, but drank a lot of water (helped her gulp it down by adding some canned dog food to it). She was getting ready for the delivery. Towards the early evening Ruuti was already getting exhausted from all the panting (opening phase), she realized that she could get moral support from her mother Capri (Larinkallion Brysselinblicca). She insisted on getting next to Capri (almost climbing on top of her, with at least her head resting heavily on Capri's tummy), and she finally relaxed enough to get a few hours' sleep. It was amazing to watch as Capri seemed to know what was happening with Ruuti and patiently let Ruuti come lie right next to her. We moved Ruuti downstairs to the whelping room around 11AM, as she had started having stronger contractions and was clearly stopping to concentrate every time she contracted. Around 11.30AM the first fluids came out, and the first brown male saw daylight at exactly midday 12.00. The next brown male arrived at 12.30, after which Ruuti had a longer break to deliver the third and last brown male at 14.45. The only female of the litter was born at 15.40. All the puppies were born hind-end first, but Ruuti had strong contractions, so they all came out on their own, and we didn't need to interfere to help. Ruuti knew instictively what to do: concentrate and push, check her behind if anything came out ;-), and then open the bag chew cut the umbiblical cord and start licking the puppy. She was absolutely superb, especially for a first-time-mum. 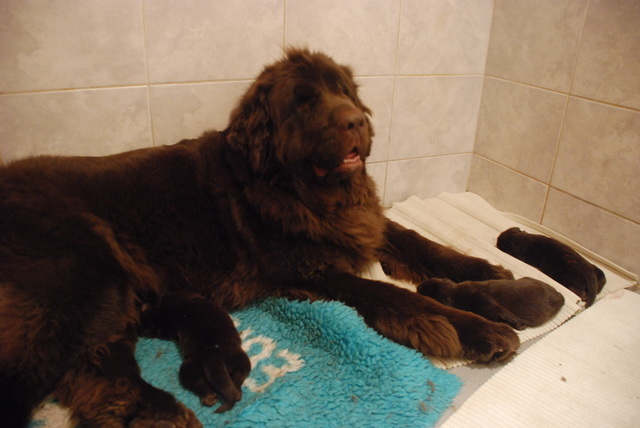 As the ultrasound had estimated, Ruuti had four gorgeous puppies :-). Isn't it amazing what modern technology can do, as the father of this litter would have turned 27 this year!! Ruuti getting ready to push the third baby out :-)! We usually give temporary names to the puppies directly after they're born to avoid calling them by numbers or by the colour of their nail polish. They are MUCH more to us than ”red”, ”yellow” or ”green”. 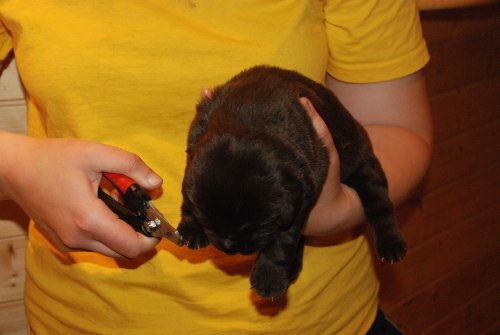 The nail polish is there, so that we can distinguish each and every puppy clearly (for the weight monitoring). The temporary names we gave the boys were Puikko, Tapio and Sampo (in birth order), though we will be changing them as the families express their call name choices to us. It is completely up to them to determine the call names, as they'll be living with the puppies 24/7 for hopefully 10-12-14 years :-) ! 1st born: passed away soon after birth "Puikko"
All the puppies have found fantastic homes :-). 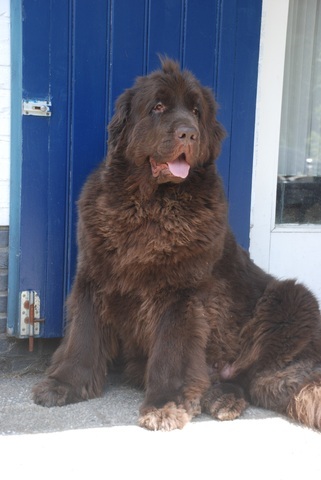 Our next litter won't be until 2012 summer :-). These next few days are crucial for the puppies to establish a solid growth pattern. 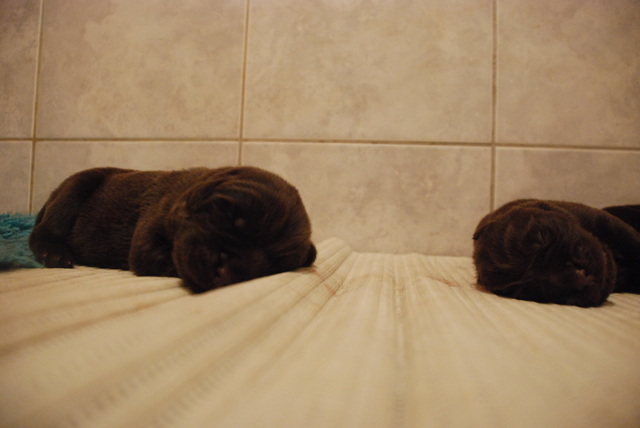 They will be kept under an infrared heater, so that Ruuti can still lie next to the puppies (on the very cold tile floor) all the time. Of course the puppies will be ON Ruuti for most of the time, but as puppies cannot regulate their core temperatures, it is important for the air to be warm enough for them to use all their energy for growth instead of maintenance energy (heat), but the room to be cool enough for the heavy-coated Ruuti, so that Ruuti can actually stand being next to the puppies. Ruuti will have a little fever after the whelping for the next few days, so lying on a cool tiled-floor will only further help cool her down and keep her comfortable. We weigh the puppies roughly every 6-12 hours (when we change shifts) to see if any of the puppies have gained or lost weight. 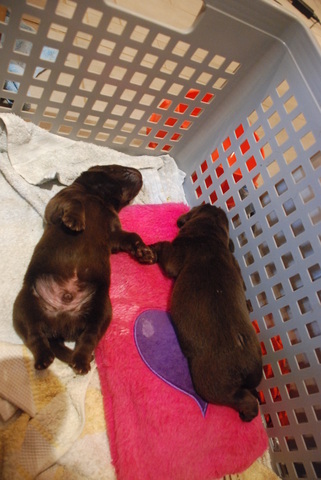 Even though a rapid weight gain is crucial, we must not let the puppies over-eat either. So far we haven't had problems with that, despite Merita being quite the girl and bullying the others out from their teats if she feels like she got the bad teat to suckle on ;-) ! The veterinarian will come and check the puppies and Ruuti out today (day after whelping) to see if he'll need to administer an oxytocin shot to make absolutely certain that everything that needs to be out IS out. We counted all the placentas (first two came out with the puppies – the last two after Merita, the last puppy), so she should be good to go, but better safe than sorry, as it would be devastating if she DID get an infection due to us not being careful enough. The oxytocin will also help with the milk let-down (especially important if the litter is huge or if the female is not producing enough milk), though Ruuti has plenty of milk for everyone to go around. She has a total of 4 +1 teats on each side, with the first elbow-teat being ”not the best”, meaning that Ruuti is able to milk everyone at the same time. The puppies with the smallest weight-gain (note: not necessarily the smallest puppy) will need to go to the best teat (often located towards the back). 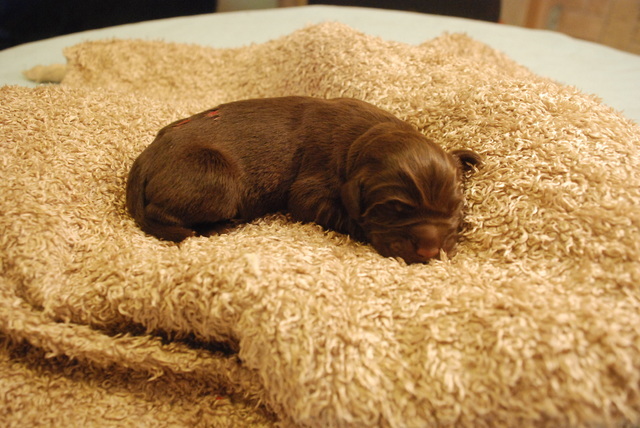 Our smallest puppy with the least weight gain (at this point) is puppy number one, Puikko, though he is doing relatively well as he hasn't LOST weight, he just hasn't gained any yet (12 hours from birth). Ruuti is finally relaxing and calming down; she wants to either turn on her back feet up to milk the pups or lie on her tummy ”froggy position” whilst, of course, snoring very deep. She's definitely enjoying all the attention she's getting. Ruuti is a very good drinker; she's been drinking A LOT of cool fresh water throughout the whelping process, which is a relief as it is crucial for her to drink a lot to keep the body's fluid balance correct. She has be expelling a lot of fluids through milking, but also through panting heavily (typical for the opening phase, contractions and now with the high body temperature after whelping). We have a new baby-thermometer in the whelping room which will help us determine how warm we should keep the room, and if the warmth is only due to the humidity. During the whelping, the rooms' humidity rose up to 74% (with 24.9C), which was definitely very, very high for us and Ruuti to tolerate. Some good ventilation was needed to bring down the humidity (and temperature)! But think how much water Ruuti expelled through panting during the actual whelping, as the whelping room has quite a large air space and the humidity kept rising over 70% for most of the time, even though regular ventilations were done. A window could not be kept open, as the puppies must not be exposed to any draft. That will cool down their body temperatures very quickly, especially if they're wet from Ruuti's slobber (Ruuti cleaning after the puppies). Unfortunately we lost the little Puikko 5-6 June night. There was nothing we could have done to save the little boy, but in a way we are all glad it happened now, and not later when the puppy was 2-3 (or more) weeks.. Of course we are devastated that we had to lose him, but more so are "his family" who were waiting to pick him up in August..! Unfortunately the losses are something every breeder will need to go through at some point. We will be burying the puppy in one of the local forests where we often go for walks. We were going to send it to be opened, but it is not routinely done here in Belgium, and so it would have been an expensive hassle to arrange it, and we just don't have the time to fight over that right now, but we'll need to see if we can get more info about actually doing for future in cases like these (as every breeder will at some point unfortunately lose puppies). Ruuti is a dog and so is not mourning after the loss of the little one, but she did "scout the house to find the puppy, but quickly realized he was not with us anymore. 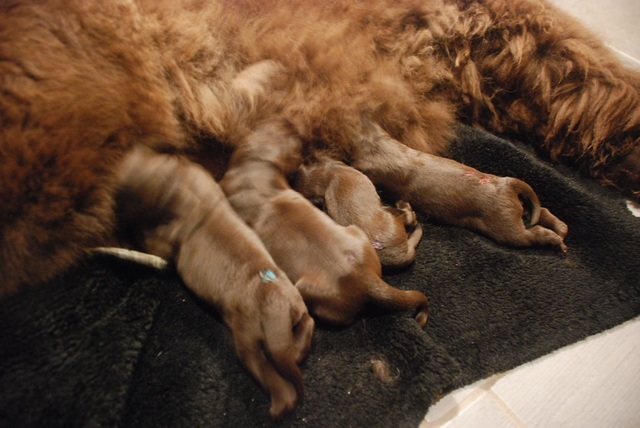 Ruuti is now busy with the other puppies :-D.
The puppies' birth weights' were 420g (Puikko), 760g (Tapio), 640g (Sampo) and 675g (Merita). 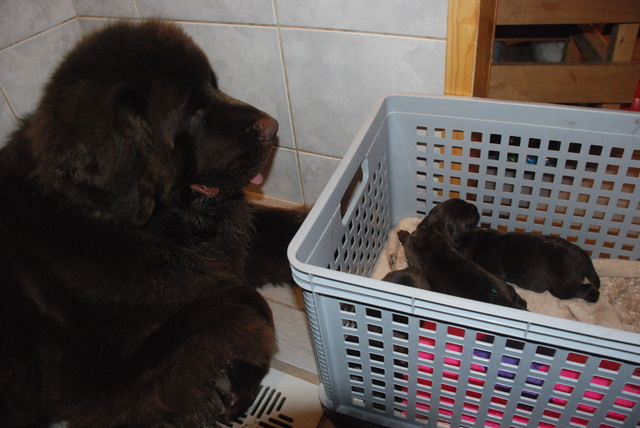 Newf puppies are born usually around 5-600grams, though 400 or 700 is not anything unusual. 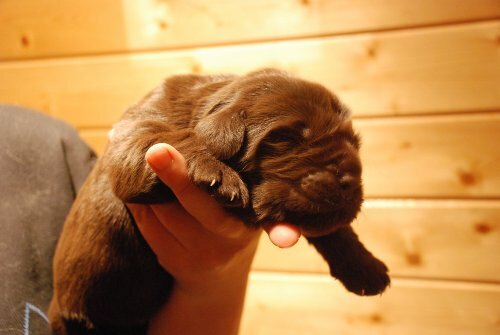 Usually smaller litters have bigger puppies and bigger litters smaller puppies. 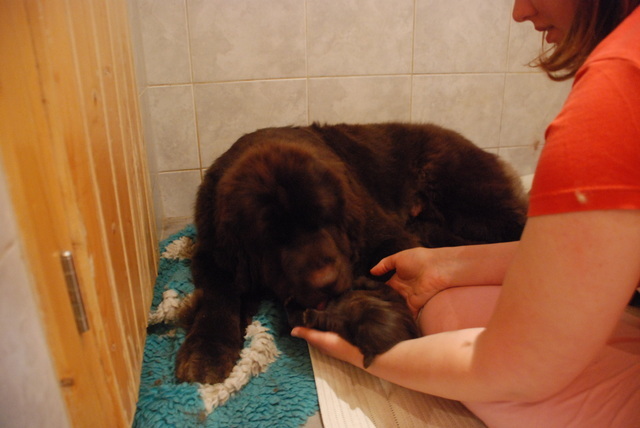 Now (7th June) the puppies are already 980g (Tapio), 970g (Sampo) and 1040g (Merita). 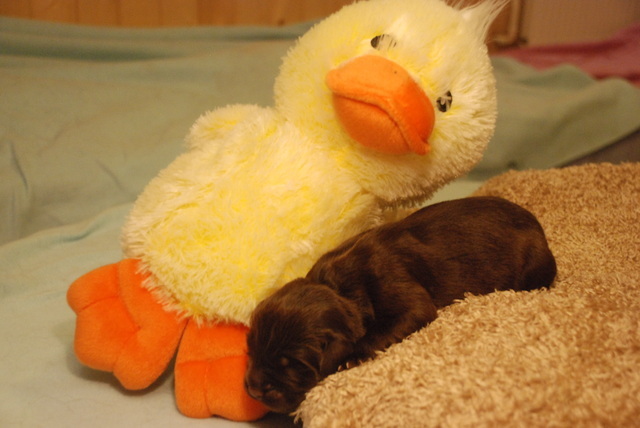 Day 1 photo with the toy - this time a yellow chick - Should we have gotten a bigger toy if these pups are already this huge at day 1 ?? Ruuti and the rest of the litter are doing superbly. Ruuti is being a fantastic mum of which I am very happy about. She fusses over the pups, wants to lick them clean and seems to only fully relax when she is with the pups, preferably nursing. 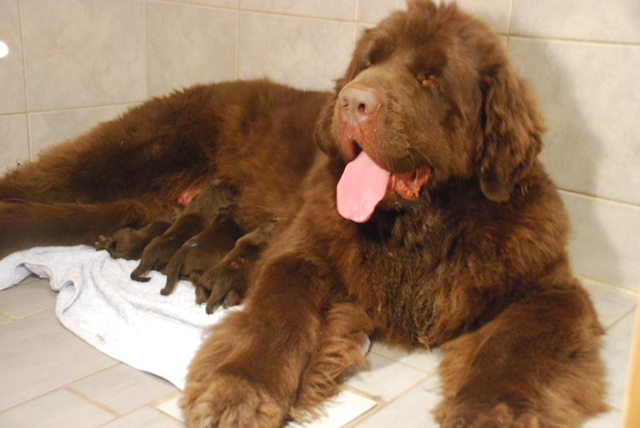 While the pups drink, their mum snores her heart out; Every once in a while Ruuti does stop her snoring just to listen at the sucking sounds to make sure the pups are alright. This is always followed by even louder snoring. What really fascinates me is that the pups are already starting to develop personalities. Merita is clearly the bossiest one… she keeps pushing the other pups away from the teats she wants, mind you they are not always the best ones, just the ones she has her eye on.. She is also the one who starts crying when she can’t drink fast enough (just like Scout from N-litter). Sampo is the calm pup and I call him the future gentleman. He seems to enjoy the handling the most, always instantly relaxing while I cuddle him (it takes a second or two for the others). He has also realized that the best strategy for milk is to let Merita and Tapio push each other, while finding the absolute best teat himself. You can often see Sampo digging himself under Ruuti to find the teat on the other side, the one neither of the other two has managed to suckle on yet. Tapio is more like Merita, though not as pushy. He is also the one that seems to love exploring, I have lost count how many times I have had to grab him before he escapes.. And he is just 3 days old now, I hope his exploring habits diffuse a bit when he is older.. or he waits a bit until his eyes are open ;-). 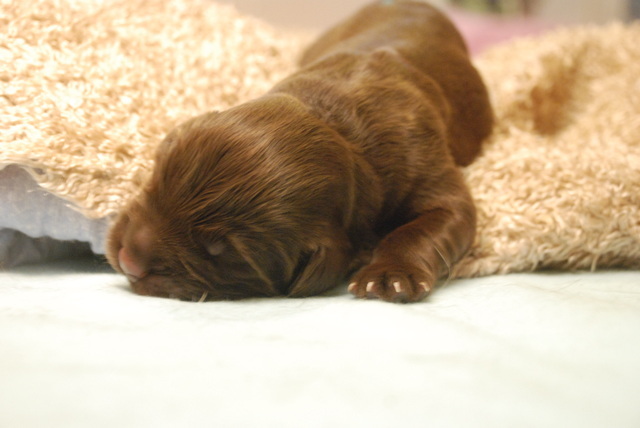 While there are some subtle personality trait differences which can be seen now, pups are like clay – you can mould their personalities at this age to almost anything you want. I bet in just a day, their personalities will change again..
All in all things are great, puppies are adorable and I really already love them dearly. The puppies are growing so fast I wouldn't believe if I wasn't seeing it with my very own eyes. 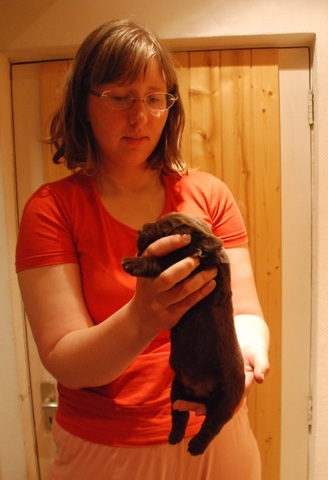 They grow around 100 grams each day now.. and Merita-the-greedy-girl (as Betti calls her) is already over 1kg. Tapio and Sampo are very very close to 1kg, and will probably reach it by morning. The pups are now fed and "running" around the puppy box all the while yelping and whining and climbing on top each other. I think I need to put them to sleep next to Ruuti for a bit longer until they exhaust themselves so we all can have a nice long sleep (it is now 2am and my internal clock is telling me to rest my eyes). 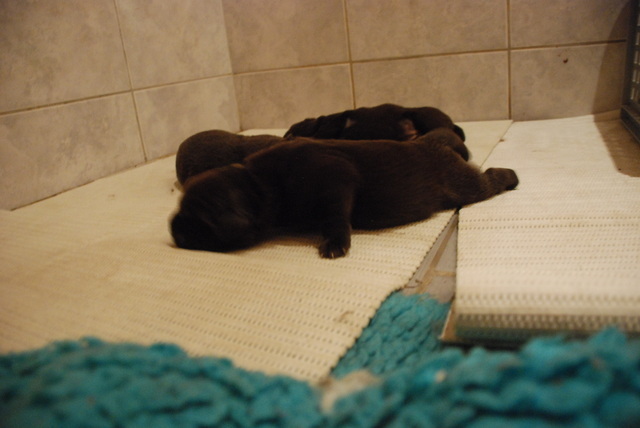 The pups need to eat about every 1h30; giving us a good long breather in between each feeding. Ruuti uses this time to sleep, eat and go for a short walk around the block with mum, while I completely zonk out for a while. It is fantastic that Ruuti knows exactly what to do: all I need to do is follow her and help where she needs me to. I am Ruuti's stalker these days..
Ruuti knows exactly when to come back to the puppyroom for a feeding - she lies down next to the basket on her own and I just lift the pups next to her. She is always very careful not to squish the pups (though I still keep an eye out just in case). Last night I actually fell asleep next to her for a bit during one of our midnight nursings (.. was just suppose to close my eyes for a second..) and she woke me up herself so I could lift the pups to the basket before she got up. Ruuti has also dug a lot of holes in the backyard - just like Vera and Capri did when they had puppies. Between feedings she likes to go in the yard for a good digging session, just to make sure that if we happened to change our minds and let her take the pups outside - the "nest" would be ready. She has also started to flip over the food bowls - I think it's her misguided attempt to "bury" the food so that when the pups are weaned she has food in store for them. Silly mother. .... Ruuti is staring me down now - time to feed the pups.. will continue in a bit..
Puppies are now fed and finally quiet. 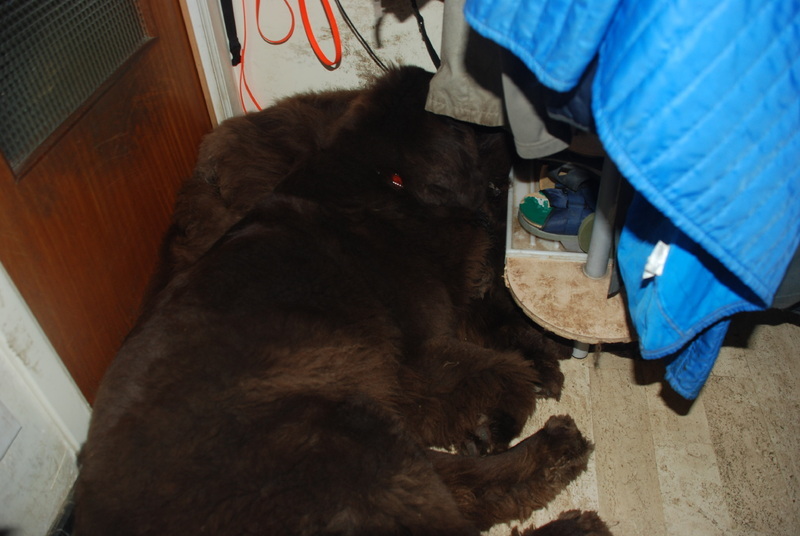 And Ruuti is now sleeping next to them; snoring. Ah, quiet house - sorta! Upstairs Capri, Vera and Data are all interested in what goes on downstairs. While they can't hear the puppies, the smells and Ruuti rushing back and forth has them fascinated. Mom told that Data actually managed to squeeze herself through the gate once and followed mom and Ruuti downstairs. Mom didn't notice until after puppy nursing. We keep all of Ruuti's food on the downstairs landing - cool spot, next to water taps and safely away from the rest of our greedy dogs. I think you know where this is going, right? Well, Data - being the always-hungry-spoiled Pug that she is, managed to inhale 2 large (and I mean large!) bowls of milk-bread-cat-food-mince-meat-mush (only thing Ruuti will eat at this point, she still doesn't have her normal appetite back yet) before mom found her. Apparently she was so stuffed that she just Stood there with a glazed look in her eyes, breathing heavily. Mom took her upstairs and for the next day or so, all Data would do is just lie in her bed and zone out; I hope she learnt her lesson. We are also a bit more wary about her following us now..
Ruuti has already given the pups a good talking to - they were making a lot of noise today and at one point Ruuti got annoyed. This was right after a feeding, the puppies tummies were full (like little balloons) and they still were crying for more. Though they wouldn't eat, they just wanted to move around and climb on Ruuti. Well Ruuti was tired and started little short-burst, staccato, barking session which quietened the pups - for a grand total of 2 minutes before the whining, yelping continued.. I need to get a cup of coffee now, my eyes are tired.. More to come later! All the pups have reached the 1kg mark! At our 11am weighing today Tapio was 1020g, Sampo was exactly 1kg and Merita was already 1140g.. They really are big puppies! 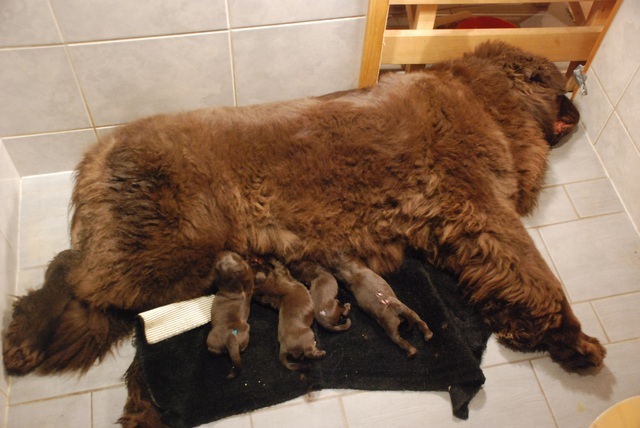 Ruuti has a lot of milk; a bit too much for just 3 puppies and last night all three had their first too-full tummies. 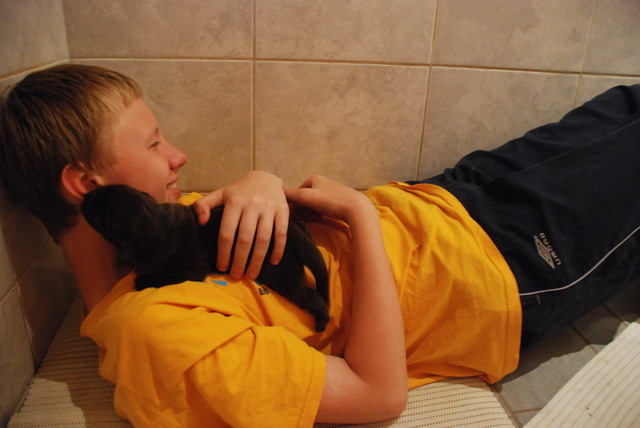 The night was full of restlessness and crying from the pups and sleeplessness from me and Ruuti. Everytime a pup would start crying, Ruuti would lick them from head to toe while I gently swung them back and forth to calm down. Good co-operation from us two, but a loooong night for both. I need to start keeping a better eye on the pups during feeding. We definitely don't want them overfeeding as it is uncomfortable and stressing for the pups and to us. And Data managed to sneak downstairs again. I have no idea how I can get her weight down if everytime I don't keep an eye on her she sneaks downstairs..! She is now lying on the couch, unable to move as her tummy gets in the way.. Silly greedy little girl. As I missed the first day after the pups were born (had a friend's wedding in Scotland at the exact time as puppies were born, only managed to rush back here on Sunday/Monday night) mom has been telling me little stories about what I missed. As we convert our sauna-room to be the birthing/puppy room for each litter, there is a smallish drain at the centre of the room for the shower water. During the birthing process mom had noticed that someone had removed the top of the drain (metal drain grid) and moved it next door and pushed it under the benches. Someone had also stuffed one of the puppy towels in the drainpipe, and I mean really stuffed it in there. Mom was really puzzled as she couldn't understand why Betti would take the drain grid and place it under the wooden benches and why she would stuff a towel down the drain .. When she asked, Betti was just as puzzled as mom, as she hadn't done it either.. The only explanation for what happened is that Ruuti had been worried about her water-loving pups slipping into the drainpipe and had in all her infinite wisdom removed the top of the drain, taken it to the adjacent room, taken a puppy towel and really stuffed it in the drainpipe. 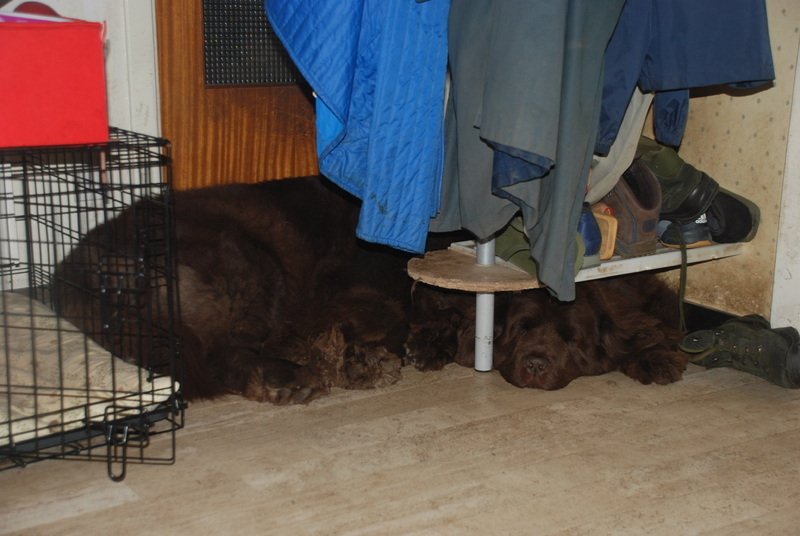 I think a pattern is starting to emerge here of an overprotective Newf-mum.. ;-) ! I have started the Battaglia handling with each pup. They really are loving the handling. We have a routine now: after feeding, Ruuti licks the puppy clean and I make sure that the pup has peed and pood. I start the handling by placing the puppy on its back as they are already comfortable with this position, I gently swing them back and forth to make sure they are as calm as possible. I think the swinging reminds them of lying on Ruuti's belly and that's why it calms them like magic. While on their backs, I tickle their toes and move their feet while calmly talking (and cuddling of course; they are just so loving and sweet!). Then it's time to place them completely horizontal and then upside down. I seem to always start with the head up position - wait 5s and then bring the puppy back on its back to calm. Though most of the time the head up position doesn't seem to create any sort of anxiety response, just a calm, happy, stuffed puppy. The head down position is always followed after the pups are calm, 5 seconds and then back on their back to calm. Ruuti liked to observe me and the pup while we do the handling exercises and of course she wants to participate too: after each handling technique she wants to lick the puppy, which is fantastic as it makes the whole situation feel even safer for the pup. I know I've said this already - but Ruuti is a fabulous mom! The basket is now officially out of the puppy room (day 5-6). We we still keep it there in case we need to quickly chuck the puppies out of the way, but they're not sleeping there anymore. The puppies have developed very thick coats, and staying in the basket (even if it is well ventilated) is too much for them. They prefer to head towards the very cold tile floor, or at least close to the cold tile wall. Even though it's not THAT hot in the puppyroom anymore, as the humidity has dropped a lot in the last few days (good thing), and the door is always open to the rest of the house (to keep it cool). 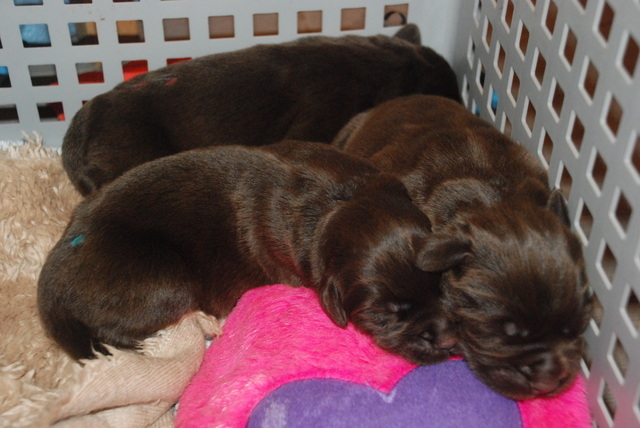 With no basket, the puppies also get much more exercise, and are hence much calmer after the feedings. They will roam around for five-ten minutes after the feedings, and then settle down to sleep for a few hours. Ruuti has so much milk that the feedings only occur ever 2-3 hours, despite the pups only needing to drink for a few minutes to get full. But that's good news for us (more sleep!) and Ruuti (can go into the corridor to cool down). The door from the puppyroom is open, so she can come in and go out as she wishes. Usually she'll go into the corridor after feeding, sleep there for a while, and come back when she starts hearing the pups move around, ready for their next feed. Ruuti will occasionally come in to just check that they're all OK, and will sometimes just lie next to the puppies to give them some company :-). But it's all great, as she gets to decide where she wants to be, and the puppies are more than content with all the attention they're getting either from Ruuti or us (though I have to note here than when the puppies sleep, they sleep, we would never distrub them just so that WE could cuddle them – it's important to let them sleep, and be totally relaxed when they sleep. That way they'll learn that nothing will ever come to them when they're sleeping, and will be must more trusting also later in life. If we were waking them up from their sleep constantly (even if it was for a cuddle), they could become neurotic, never learning to sleep the deep sleep as they would expect something unexpected to happen everytime they close their eyes). A pup getting on its' feet slowly but surely (day 6), back legs to follow (in the next pic of the series.. ;-) ). 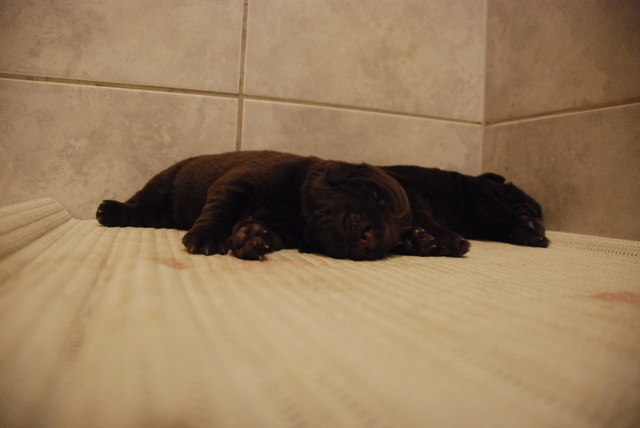 The puppies are already getting on their wobbly four feet (day 5). Sampo (also lovingly called the ”Beachball” (Rantapallo) due to his always full tummy!) was the first to try it out, but Tapio and Merita are following his example. Expanding their area was therefore very important as now they get to practice walking, exercise their muscles and also develop their sense of balance. 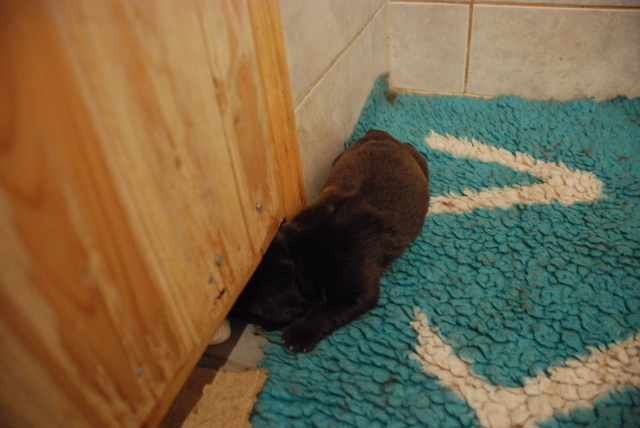 A few of the puppies are already ”running” away to either the cool floors or under the door to the actual sauna ;-) ! It's amazing how they ”know” where they're going even though their eyes haven't opened yet. Though I have to say I do wish their eyes opened soon, as for example Merita ”ran” into the wall yesterday accidentally on one of her escape trips ;-)! The puppies' temperaments have swapped again. Sampo is now the ”Orka” from out N-litter, meaning that he's the whiniest puppy ever :-D. He whines if he doesn't get enough food, if he's too full, if he's lying on the wrong side, if he's unhappy, etc.. the list just goes on. 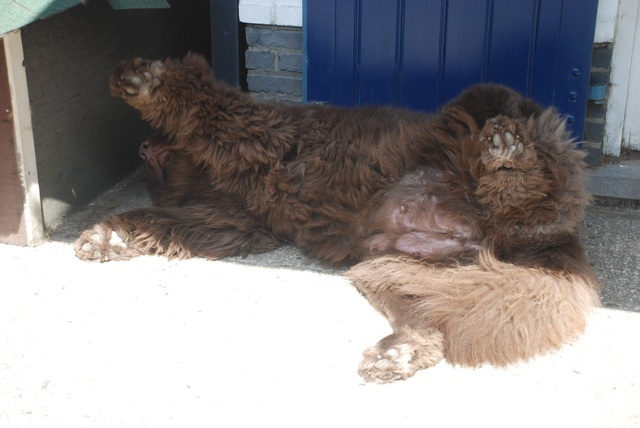 But then again he'll be fully content and happy if he's in our arms being rocked, or sleeping Ruuti's tummy ;-) ! I think he's already getting spoiled for always getting what he wants! Tapio is now much less bossier than before, though he still is the escape artist of the group, always wondering off to new places! Merita's not that greedy anymore, and actually skipped a meal yesteday to have her beautysleep as she'd stuffed herself full the previous time! The puppies are not just ”crying” anymore, but they're definitely extending their vocal range from content grunts to unhappy murmurs all the way to whining if they're lost or confused. They're starting to sound like little-dogs, but no barking yet. They ARE yawning well though (first yawns day 4-5). And their umbiblical cords have come off (around day 3). Today (day 6) will be their first nail clipping session, as the nails are surprisingly long and sharp! In general I think their feet are much bigger than any of our previous litters' paws, but it might just be that I've already forgotten. They're HUGE compared to the rest of their bodies. Vera is very jealous of all the extra attention Ruuti's getting. Everytime we come upstairs form the puppyroom, she flops on her back (four feet up) and starts smiling, wanting all the cuddling and attention she can get. And who could resist the ”smile” :-) ! This week we've been joking that her face muscles must be hurting already since she's smiling all the time! It really is a ”smile” with her front teeth showing as widely as she can manage :-)! In case you were wondering about the call names. Merita is Betti's pup and her first part of the name "meri" means sea - good for a waterworking dog; right? In Finland there is also a bank called "Merita" - though while Nefws are a big drain on the wallet; that had nothing to do with why we named her that ;-) ! In Finland there is also an insurance firm called Tapiola (to follow the theme of banks and such..) And I just really like the name "Tapio". Sampo is also a bank in Finland - goes well with Merita and Tapio. In Finnish mythology Sampo is also a magical artifact that brought good fortune to its holder. Just a tidbit of information if you were at all interested. 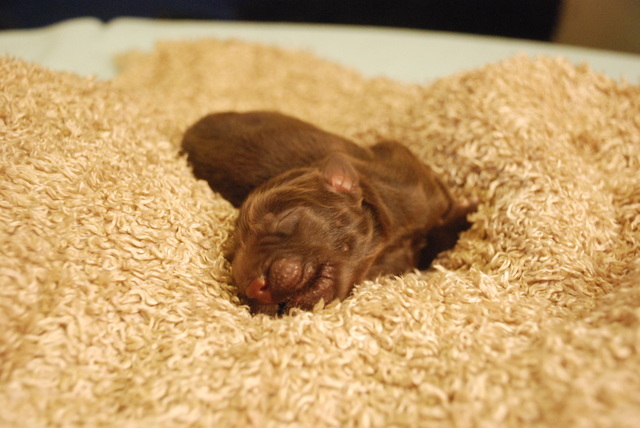 Today the puppies are exactly one week old. 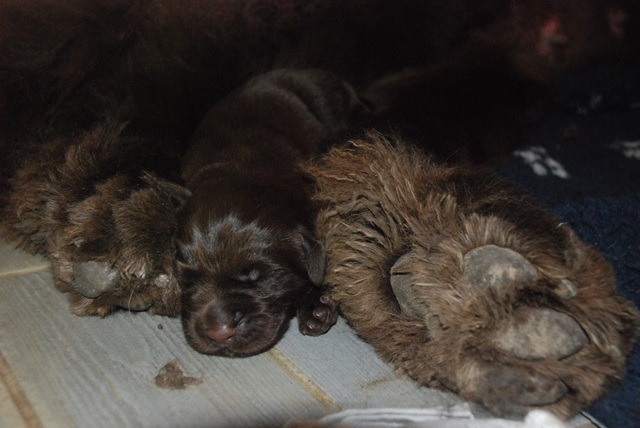 The nails have been cut, the pups are starting to move around and they have almost doubled their birth weights. The weights today morning were 1260g (Tapio), 1240g (Sampo) and 1400g (Merita). I don't know how Merita is so heavy compared to the boys, as she doesn't look any bigger than the others. Actually Sampo probably looks the biggest, just because of his always full tummy.. Hence the nickname Rantapallo (Beachball). Right now Ruuti has TOO MUCH milk. She gets uncomfortable if the pups don't drink every hour, but the pups are STUFFED. They physically can't drink anymore than what they're drinking now or otherwise they'll just cry the whole day and night due to their over-full tummies. Luckily the pups know (at least most of the time) when to stop drinking, i.e. when they've had enough. Ruuti's eating much better now, almost back to normal food :-). Tapio surpised us yesterday and repeatedly tonight. I've been writing in the blog that Sampo was the first to get on his four feet and wobble around, but Tapio actually pooed on his own several times last night! The way he does it is that he'll stop drinking, go to the side, get up on the wobbly four feet and concentrate real hard (to not to fall over and to push the poo out). 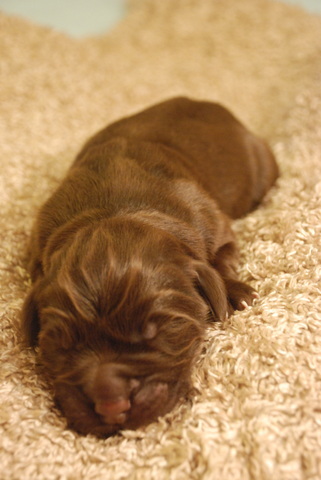 Amazing, but then again, we're easily amazed when it comes to puppy development :-). You know what this means; the puppy-poo-phase is starting ;-) ! But we're really glad that Tapio knows how to already instictively ”leave the nest” to do his business outside. If he keeps up that skill, he'll be potty-trained in no time (and that'll make our lives a lot easier) ! Today it's time for the weekly chick-pics :-) !